January and February were great months to start 2012 for St. Francis Food Pantries and Shelters. Angelica Harrison from Teach for America started us off with a very generous Canned Food Drive and donations to our Annual Winter Coat Drive. Her efforts to help us benefited several shelters in our network. Gensler Architects were the first to sponsor a "Peanut Butter & Jelly Sandwich Day." The project was organized by Nicole Lefbvre who coordinated 80 of their employees to make over 2,500 sandwiches for our "Brown Bag Feeding Program." Disney also sponsored a "Peanut Butter & Jelly Sandwich Day" with a very energetic group of volunteers who made over 1,000 sandwiches for our clients. Hundreds of cases of food for St. Francis Food Pantries and Shelters' "Stocking the Shelves" Program were delivered to many of the food pantries, soup kitchens and shelters in our network. This allowed these locations to begin the New Year with enough resources to meet the ever increasing need for food by their clients. St. Francis Food Pantries and Shelters held the "Annual Dinner for the Needy" at the end of January. Over 500 homeless and shelter residents gathered in the warm Church Hall at St. John the Baptist Church for the meal. 60 volunteers performed "wait staff" duties and served this delicious meal in a sit-down-dinner style. Our Tenth Annual "Thanksgiving in February Feast" offered over 900 of the clients in our network a complete Thanksgiving meal at the Affinia Manhattan Hotel. 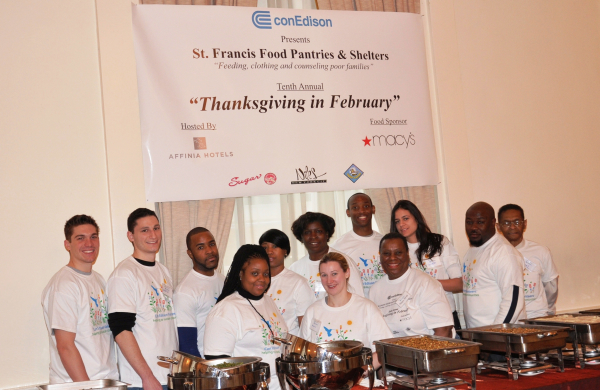 Con Edison sponsored the event and Macy's was the Food Sponsor. Their 150 employee volunteers were joined by Broadway Legend Chita Rivera, Miss Teen New York Sabrina Mastrangelo and Survivor Redemption Island cast member Andrea Boehlke on the serving line. Some volunteers made balloon sculptures and entertained the children with face painting, and a Magician and special visit by Spiderman added to the fun. Thousands of winter coats and garments collected from our "Winter Coat Drive" continued to be distributed to the needy. Ross Stores generously donated over 600 new men's, women's and children's coats after seeing the NY1 "New Yorker of the Week" coverage of Mary Anne Fusco and her efforts to collect coats for us. All of these donations and events were received with many thanks by the thousands of less fortunate New Yorkers helped by St. Francis Food Pantries and Shelters. 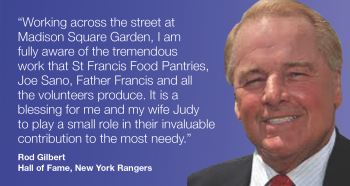 We are grateful to everyone who supports the mission of St. Francis Food Pantries and Shelters.